Holy Mountain is the source of PUISSANCE, the power and might to triumph over evil. Looks like heads of people. The branches are hair. Note that the left eye of dominant male figure, is also the face of a female person. You notice what looks like the bald headed person with bushy eyebrow. The image in front of him is a woman, It fist gives the impressionof being his lips. See encircled relevant images below. This being has a face that is not of this world. The nose and mouth are not humanlike. Has distinctive eyes. Top right is what looks like a hole. This is one of the shafts of the passageway between universes or interstelar spaces. You can see the eyes of this huge being at the top. See also, encircled features below. Some being seem to be inside another being, because there is no space, gap, or atmosphere in Heaven. 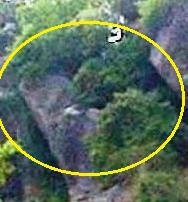 View the picture of Holy Mountain IDACHA (pronounced idasha) over and over many times. Make it your desktop picture. Look at it sometimes in the night, and sometimes in the day. 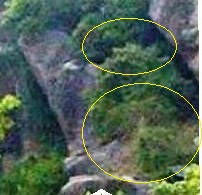 Notice the varying formations and discover that those heads are alive. Communicate with them and receive your own message. Discuss it in the FORUM. Do not just take my word for what they are; discover, and formulate a story just for you. You may send your observations to the Oboiro if you like. Publish your impressions and opinions on the FORUM: Start a topic. Discuss them with others: It is not a secret—acknowledge and bear witness. 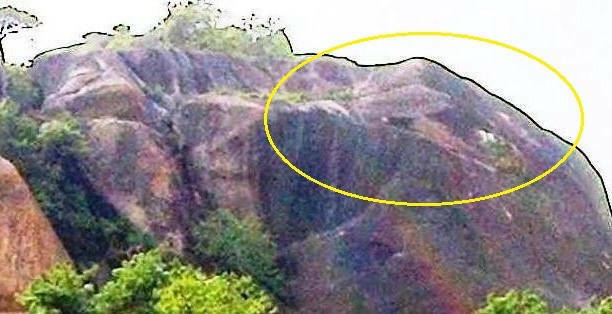 Holy Mountain IDACHA (pronouced IDASHA) is one of the landing sites of founders of the world. 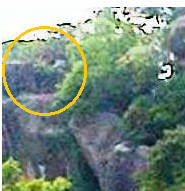 The site appears to be formed from their landing vehicle. 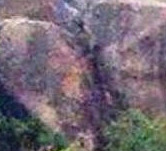 It exhibits the bared faces of various beings with opened eyes. 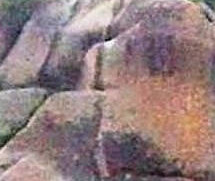 Some of the beings have human forms, while others are plants with human features. Some have tree leaves as hair. Some of the trees have open humanlike eyes. There are holes that we believe are invisible shafts joining universes: They are the shafts for interstellar travelers with or without special vehicles. This is the top level with plants. The landing at the bottom of the shaft was revealed to the Oboiro, and he made a bronze casting of it. These figures were Gods to the ancients who had legends of chariots of the Gods. Various creation myths tell us that we were created in the image of the dwellers of the Holy Mountains, or gardens, or holy natural spots of marvel and miracles. Beings that are on record as ETFs or UFO still travel between universes and time-spaces. We might have to rethink the idea of founding the world, and start talking about a continuous creation process instead, with creators coming many times and arriving in different places on our planet at different ages. Note that this creation process continues, and humankind are participating. The lower level features Sanctuary of Lake ARIGBO . The lake has not dried up for the past thousands of years. The legend about the water is that it is the efluent of the production of the dwellers. (This legend applies to all Holy Mountains--everyone of them has a lake or fountain. 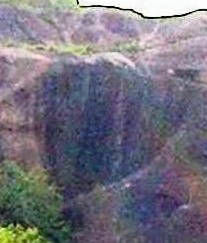 The Holy Mountain IDACHA remains the source of PUISSANCE, the power and might to triumph over evil.